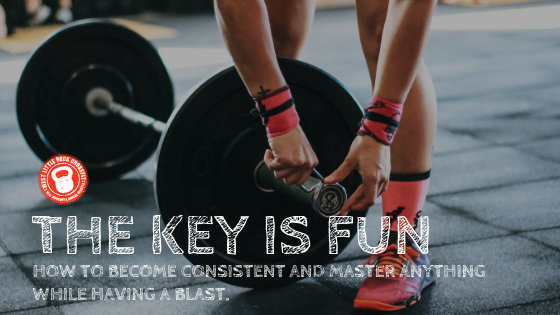 If you want to get consistent with anything, make it fun. Any artist, tradesman, or award-winning athlete can be the best of their generation, but they wouldn’t deem it worthwhile if they hadn’t enjoyed the process of getting there. There are documentaries about the brilliant masters who were never happy with their work or abandoned it entirely for something else. But that’s not you. You get to learn from the lessons of others. To make something fun is so wonderfully simple. Think about what you know today that you didn’t before. The brain loves learning. What smiles has this endeavor brought you? What relationships have formed because of it? What progress have you made as a human being, but also as a person? Basically, what is real now, that wasn’t before you embarked? Look at these things often. If you do and remind yourself to pay attention to what’s happening, you’ll see what’s been fun and you’ll have been consistent long enough to master a skill or build a house or have abs. But it won’t work the other way around. The process creates a product. Not vice versa. Love the process, and the product comes.